Friday evening. Amanda and I hustle to get showered and dressed in our fallout/construction zone of a house, after we realize that the clock on the wall is an hour behind. We are going pick up our friends Staci and Gary Cail, where we will go to dinner and then to the Orpheum to watch The Book of Mormon. The Cail’s and the Horrell’s fit pretty well together. Gary and I are both dipsh*ts who don’t have any sense, but like to act inappropriately and have a good time. Another thing that Gary and I have in common is that we both married WAY above ourselves. Both of our wive’s are smart, attractive, hospital workers who speak a language that we don’t understand. Gary works for a security company, so his occupation includes “selling security stuff”, I have a weed control and fertilization company, so my job includes “killing weeds and slingin fertilizer”, but Amanda and Staci work in a hospital, so there job includes hemotricrat levels, blood sugars, transfusions, codes, compressions, incubations, fu*ktons of anachronisms, 6 syllable words, and terms that I would not be able to pronounce even if I put my tongue through a six-week yoga class. We were headed to Mid-town to try out the restaurant ELBO, and woof down a burger before the play. The ride down there was fun as Amanda and Staci discussed various procedures which must take place during emergency situations, when one’s life is on the line. Gary and I discussed getting suspended from school and compared courtroom experiences. This was gonna be a good night. Dinner at ELBO was awesome. They had a great burger and some incredible cheese dip (although most every burger I’ve ever eaten has been great and all cheese dip incredible…cheese dip technology has come a long way.) After dinner we get back to the car, where I will be given turn-by-turn directions to the Orpheum. I require driving instruction to even make it out of a parking lot. My sense of direction is rivaled only by my attention span deficit, so I need someone to tell me every move. The fact that I have lived in or around Memphis my entire life, has no bearing on the fact that I am in a foreign country every time I get behind the wheel of a car. Everyone is very patient with me as they provide instruction. We find a parking spot downtown and we are traveling on foot to the show. We see some Mormon faithful on the street corners handing out information, and it took me a second to put it together, why they were there. We make it to will-call, successfully get our tickets, hit up the restrooms, and we are off to our seats to enjoy the play. MACK DADDY SEATS. We were sh*ttin in high cotton. Staci had somehow managed to get us some really fine seats, ya know the kind where someone has to unhook the big velvet noodle to let you across. I felt like the governor or something. Now, my mom had warned us of The Book of Mormon. She said it was really funny and entertaining, but it could also be very offensive if you were offended easily. I could not imagine anything REALLY being all that bad. Gary, having seen the play once before, informed us of the mass exodus that would take place as some of the less informed audience saw what the play had in store. Keep in mind that this was written by the same people that write the TV cartoon South Park. Some of the folks in the audience were most likely season ticket holders, who were just seeking entertainment and probably had no idea what they were walking into. As the lights went down and the music kicked off, it was clear that this would be, if nothing else, entertaining. It was cheeky, and it was funny, but nothing too bad. It wasn’t until about twenty minutes into it, when the Mormon’s showed up to Uganda that the sh*t hit the fan. Wow! It escalated quickly. It was the kind of shock humor that is….well, it’s funny and it’s shocking. It was yet another experience in sociology. To watch and feel as people were offended from the inside out. While I get my feelings hurt easily, I don’t see my self as being easily “offended”. Far from it. However, I could relate to both sides. Personally, I thought it was funny as hell. The cast was great, and the characters were played out to some really funny stereotypes. I could certainly relate to the people who felt uncomfortable, or even those who were angry. I do not think that laughing at the material or getting angry about it is more “right” or “wrong”, as I don’t really have an opinion, but it was certainly interesting. I am not saying that one should be offended or laugh, but I chose to laugh at this one. The offended certainly would certainly pose a good argument as to what offended them, but it was also an opportunity for those who take offense to most things to twist their fists in the air. Some people look for any opportunity that they can to be offended. I know people that you have to watch every word that comes out of your mouth because they are just gunning to find that word or phrase and twist it into something that hurts their feelings. These people can be hard to deal with. They are not easily offended as much as they are selfish, and looking to derive some sort of pleasure from, or to gain some sort of attention from making you feel that you have offended them. There were most likely quite a few of the perpetually offended types, or at least those who are always on the lookout for somethings which offends them in the audience. I missed the argument, but Amanda, Staci, and Gary were all watching as the couple next to us argued back and forth. They, like some others, did not make it back after intermission. All and all, The Book of Mormon was really entertaining, well put together, and really freakin funny. I chose to find the humor in the humorous and simply discard the potentially offensive. It’s always a choice, and it is more fun to find the humor than the offensive. In trying to be humorous, there is always the risk of crossing the line, and when that line is crossed, people are gonna be looking for it. Some people miss the humor, because they are waiting like a cat to find that reason to be offended, and then pounce on it like prey. 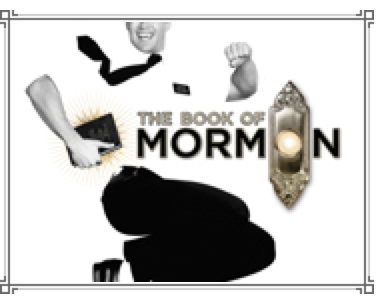 I think that The Book of Mormon was a great opportunity to exercise the CHOICE of whether I want to laugh my way through a situation, or ball up and be angry at a situation of which I have no control. This was all in good fun, and the people who put it together were top notch. The performers in the play were full of character and extremely talented. The dancing, singing, choreography, and the music were really well, and my company was spot-on.Yall have a good day. When given the opportunity to laugh, ignore, or take offense, try and take one of the first two options. Don’t be that guy or girl. Enjoy the day.